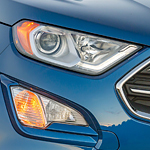 Explore the Ford EcoSport Technology at Anderson & Koch Ford Inc. | Anderson & Koch Ford Inc. Explore the Ford EcoSport Technology at Anderson & Koch Ford Inc. The Ford EcoSport is a popular compact SUV for you to enjoy in North Branch. It’s packed with technology to provide you with convenience and safety. A test-drive will allow you to test the technology for yourself. A lot of available technology is packed into the EcoSport. This includes an LCD touchscreen that helps to keep you connected. You’ll have voice-recognition capability to access all of your apps, allowing you to avoid taking your hands off of the wheel. Fast-charging USB ports will ensure your electronics are always ready to go, too. You can also stay safer on the roads because of integrated technology. BLIS will help you to detect vehicles because of the advanced blind spot sensors. Other Ford safety features are also included, such as cross-traffic alerts so you know what’s happening when you back out of a parking spot or down your driveway.